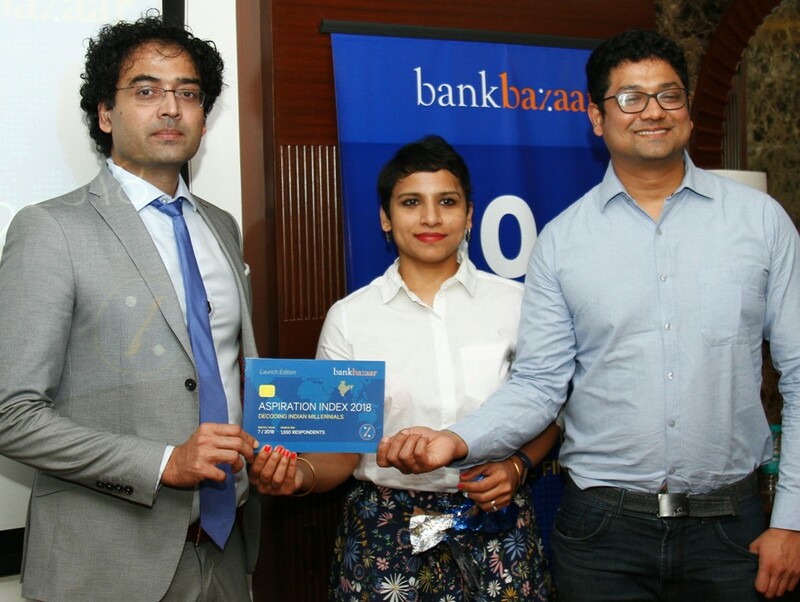 As part of their 10th Anniversary celebrations, BankBazaar, India’s leading online financial services marketplace, today launchedIndia’s first Aspiration Indexof millennials.Executed by KANTAR IMRB,the BankBazaar Aspiration Indexattempts to understand the Indian millennial from a personal finance perspective. The first of its kind indicator, the Aspiration Indexanalyses the hopes and desires of millennials based on six goals—Wealth, Fame, Image, Relationships, Personal Growth, and Health. The study pegs the Aspiration Indexof Indian millennials at a high of 87.43, reflecting the highly driven and confident outlook of the millennials. South India tops the Aspiration Index at 88.5,higher than the national average,with Chennai at 88.8 topping the index across India. North, East, and West India come up at 87.7, 86.6, and 86.0 respectively on the index. While Chennai’s top position was not a big surprise, in a revelation of sorts, the second spot in the index was claimed by Jaipur at 88.5. This reflects a sea change in how non-metro millennials aspire and chase their dreams. With growing career choices, financial independence, and shift in societal norms, more and more women are daring to dream big. On the whole, women ranked higher on aspirations compared to men. This is also reflected in the rising number of female visitors accessing BankBazaar. For Indian millennials, Wealth is the topmost priority followed by Health and Fame. Despite the regional variations, the core aspirations of the Indian millennials, both men and women,remained the same—a home of their own, sufficient bank balance and a chance to see the world. The desire to own their own home comes out on top with 47% of millennials calling it their top priority. The study revealed that more than 61% of the millennials are comfortable taking credit liabilities to fulfil their aspirations. This desire resonated across East, West, North, and South India. Speaking on the occasion of the Index launch, Adhil Shetty, Co-founder and CEO, BankBazaar, said,“The last 10 years have been a whirlwind decade for India in every way. The technology, the generation, and the outlook have undergone significant changes since we started BankBazaar in 2008. So we thought our 10th anniversary to be the perfect time to consolidate our understanding of the Indian personal finance market and see what the future is like. The study also throws up quite a few interesting gaps between aspirations and readiness. The top priority for atypical millennialis wealth, especially owning a home. However, this particular goal has one of the highest aspiration-readiness gap of 12 points. Contrary to popular perception, the study showed that millennials are big on saving and investing. Investments are spread across the spectrum from FDs to mutual funds, and on an average, tend to be one-third of their wallet share. However, the choice of investment vehicles, predominantly FDs and insurance as opposed to mutual funds, could be responsible in part for the gap between aspiration and readiness. Health is the next most important goal, with health-conscious millennials looking at physical and mental well-being as a key life-goal. Incidentally, this segment also has the highest aspiration-readiness gap of 12 points. The index analysesthe relative importance millennials give to various life goals, be they—monetary, lifestyle, or health—as well as their preparedness and likelihood of attaining these goals. To arrive at the analysis, a study was conducted by Kantar IMRB among 1,551 respondents across 12 cities. The results followed a quantitative research approach by using online panel interviews with the help of a structured questionnaire that was targeted towards salaried men and women between the age of 25 and 35. A higher importance, readiness and attainment across the six goals indicated rising aspirations. Attributes within each goal were determined based on in-depth scoping interviews before the quantitative phase. BankBazaar, ranked as the best financial website in India by the Internet And Mobile Association of India (IAMAI) and the best emerging brand in Asia by CMO Asia, is India’s first neutral online marketplace that gives you instant customized rate quotes on loans, credit cards or any other personal finance products. It simplifies the loan application process. Anyone can instantly search for tailor-made offers, compare, customize it as per his or her need or profile and apply for their finance products. It is designed with smart technology capabilities and over 85+ of India’s leading financial institutions and insurance firms have chosen to integrate themselves with the platform. For the online consumer today, banking is as easy as shopping for anything online. What’s more, BankBazaar's services are completely free! Apart from India, BankBazaar.com also has an office in Singapore and Malaysia. It commenced operations of BankBazaar.sg in 2016 and bbazar.my in 2017, and is well positioned to be a fully integrated online acquisition channel for partner banks.